Far left activists are already plotting their next move if Judge Brett Kavanaugh is confirmed to the Supreme Court. 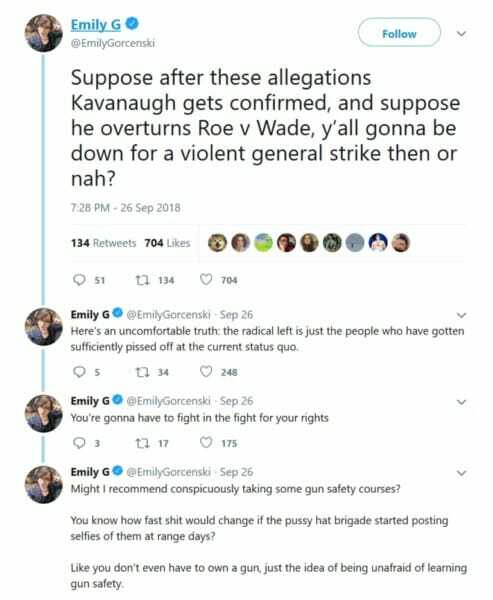 Following yesterday’s Judiciary Committee hearings, prominent activist Emily G called for a violent general strike if Judge Kavanaugh is confirmed. Emily G is no random leftist kook. She is one of 3,641 people followed by Twitter CEO, Jack Dorsey and one of 503 people followed by the Southern Poverty Law Center‘s “Hate Watch” account. 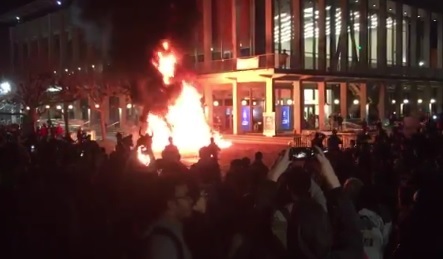 On Thursday leftists on Twitter began discussing the need for a “violent general strike” if he were to be confirmed. This comes just days after a violent antifa group confronted Senator Ted Cruz and his family at a restaurant and then made credible threats against the lives of Senator Cruz, Judge Kavanaugh, President Trump, and others from their Twitter and Facebook accounts. The original Twitter thread (archived here) came from Data Scientist and left-wing activist, Emily Gorcenski. Read more on the left’s plans for violence at Far Left Watch.